Every dog pants when it's overheated or engaged in vigorous exercise. Panting is a normal, important behavior for all breeds of dogs. It provides the same cooling effect as sweating in human beings because it allows evaporation of water and heat from moist surfaces of the lungs and tongue. Typical panting occurs when a dog is hot, has been exercising vigorously, or is excited. Many dogs also pant when they are anxious or frightened. Sometimes, though, dogs appear to be struggling for breath. There are many possible reasons why your dog may be hyperventilating, including every-day triggers such as over-excitement and anxiety. It's also possible that your dog may be experiencing a "reverse sneeze," a harmless but surprisingly loud respiratory spasm. Hyperventilation refers to abnormal panting when a dog appears to be struggling for breath. As medical management varies greatly with the diagnosis, a proper assessment is essential to determine the cause. The only way to know for sure what is going on with your dog, and whether or not panting is abnormal, is to have it checked out by your vet to rule out a respiratory issue, heart problem, or infection. It's important to note that if your pet displays inappetence (a reduced appetite), isn't acting "normally," or shows changes in urination, or other signs of illness, please see your veterinarian as soon as possible. It's important to note that certain breeds, including Boston terriers, bulldogs, and pugs, may breathe more heavily than other dogs because of the structure of their snouts. Over-excitement and anxiety are both factors that could contribute to a dog hyperventilating as both of these conditions accelerate the dog's heart rate and breathing, oftentimes overly so, causing a shortness of breath. While there is no real harm or type of treatment for this type of hyperventilation, medication can be prescribed to your pet if the problem becomes chronic to reduce anxiety levels. Alternatively, removing the dog from frightening or exciting situations when it begins to hyperventilate will typically allow it to calm down and breath properly again. Respiratory issues are the most problematic causes of hyperventilation and excessive panting in pets. Diseases and problems which can cause this include conditions such as overheating, pain, Cushing's disease, anemia, heart failure, or laryngeal paralysis. No matter the cause of your dog’s excessive panting, you should always have it examined by a vet to rule out possible life-threatening ailments. Metabolic acidosis is a condition resulting from increased acid production from metabolism or reduced excretion of stomach acids. Metabolic acidosis could be caused by underlying conditions like diabetic ketoacidosis, renal failure, or respiratory dysfunction. Some of the causes of hyperventilation are easy to treat and are likely to have no ongoing negative outcome. Specifically, a dog that is suffering from heat stroke, anxiety, or over-excitement can be removed from the situation and provided with shade and water until it has calmed down. Respiratory issues can be traced to a variety of causes, many of them serious, and most of them treatable. Pain as a cause of hyperventilation should always be investigated. While it can be the result of a simple injury that can be easily addressed, it can also be the result of a more significant underlying issue. Cushing's disease is treated with steroids; this treatment can actually lead to hyperventilation. In some cases, treatment can be modified to lessen extreme panting. Anemia is an iron deficiency, which can be treated with dietary supplements. Laryngeal paralysis is a neurological condition which can cause loud, raspy panting. Unfortunately, it is usually an early sign of progressive general neuropathy which, over time, can leave a dog unable to function. While there is no cure for this disorder, there are ways to help ease a dog's discomfort; in some cases, dogs can live well for years with progressive general neuropathy. If you begin to notice a problem in your pet, take a short video of your dog when he is hyperventilating and bring it to your vet—it's a valuable tool for assessing the behavior since the breathing pattern may not be exhibited during the exam. Some of the causes of hyperventilation are easy to avoid. Because continuing exposure to heat can be a problem, it's a good idea to provide your dog with shade and cool water during the summer months. If your dog is anxious in certain avoidable situations, simply avoid them; if the situations are unavoidable, do your best to provide your dog with familiar toys, foods, and plenty of water. If the underlying causes of hyperventilation are organic rather than situational, however, there may be little you can do to prevent the problem. Regular veterinary care can catch problems relatively early, which usually makes it easier to treat, slow, or cure your pet. A reverse sneeze is a respiratory spasm that produces a "goose honk" sound. Dogs will sometimes reverse sneeze from excitement, being tugged on a leash, sudden temperature changes, or from allergies or post nasal drip, though sometimes a cause cannot be determined. 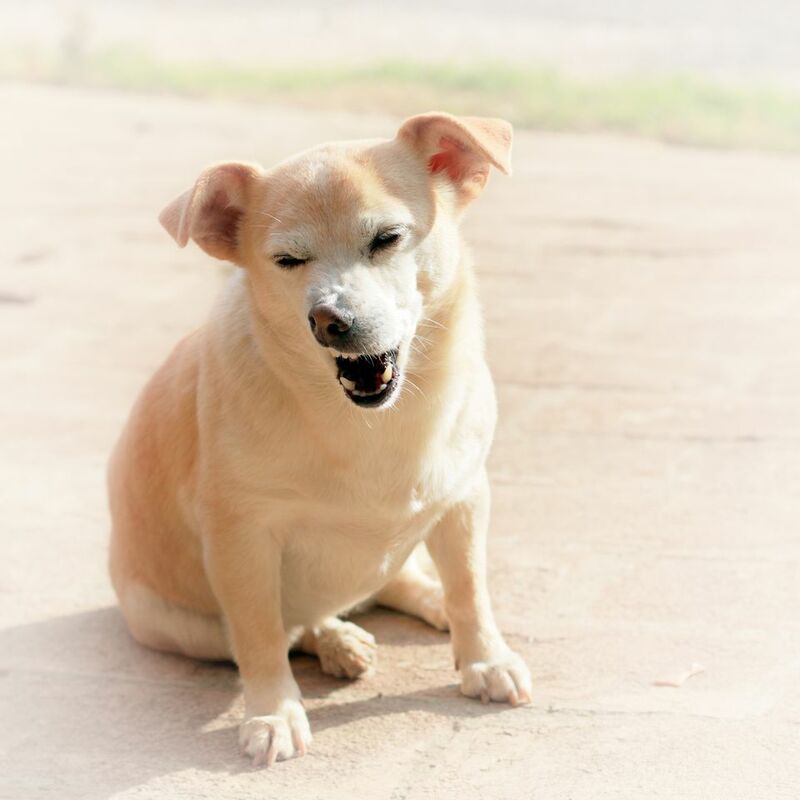 Though reverse sneezing itself is harmless and won't harm your dog, if it's a common occurrence, check with your vet to rule out potential underlying causes. Treatment is usually not needed for reverse sneezing, and in most cases, once the mucus or foreign matter is removed from the nasal passages, the honking reflex will stop. However, if a cause can be determined, eliminating it will usually solve the problem. For example, dogs that have a sensitive trachea can benefit from a harness versus a collar. You can also try keeping your dog calm; distract it with a treat or toy and redirect his attention if the overexcitement occurs when family members enter the home. Getting your dog to swallow will usually stop the respiratory spasm. One way to do this is to blow a small puff of air into his nostrils. Another method to gently rub the throat area.